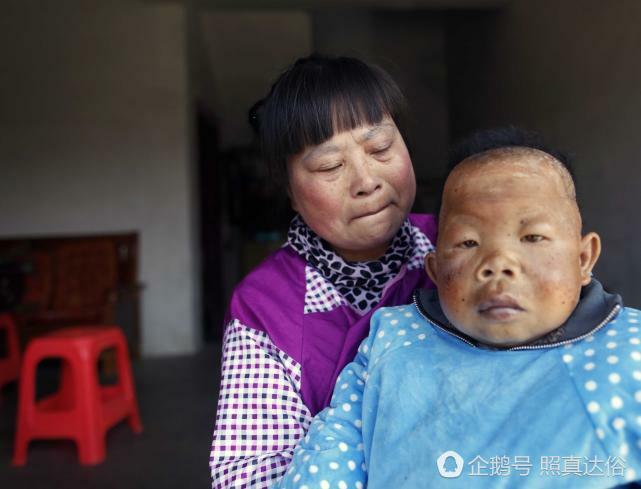 A mysterious condition has left a 30-year-old man in rural eastern China looking and behaving like a small child. He cannot speak, can only stand for short periods of time and needs round-the-clock care that his loving mother is happy to provide. Looking at Wang Tianfang, you would swear that he couldn’t be a day over 4-years-old, but he was actually born in 1987, which makes him 30. His mother, Chu Xiaoping, says that both Wang’s physical and intellectual development stopped when he was between 2 and 3-years-old, and that despite being consulted by several doctors, the reason for his stagnation remains a mystery. The 30-year-old man is only 80-cm-high and is unable to speak or feed himself. A teary-eyed Mrs. Chu, 52, told Tencent reporters that when Wang was only three and his health problems became obvious, many of her neighbors advised her to abandon him on the steps of the local Buddhist temple and get on with her life. They told her to have another baby, one that would hopefully be healthy, but the woman wouldn’t hear of it. She has dedicated her life to caring for Wang, and says that all she wants is for him to stay alive. “I know he’ll never recover, that’s impossible, but I just want him to live on, I don’t want him to die,” the mother said. Even though doctors had previously told the 52-year-old woman that her son would not live to see 30, with her care and attention, Wang has beat those odds. Looking after a disabled son for so long has been a daunting task for Chu Xiaoping, but she has somehow managed it. The single mother puts food on the table by picking tea leaves in the nearby mountains and working as a part-time cleaning lady in the village of Wangfan, China’s Anhui province. She used to leave Wang alone, but after he fell and hit his head a few years ago, she asks her neighbors to keep an eye on him until she returns. The 30-year-old stuck in a toddler’s body has never been able to speak and walk, and can only stand on his own two feet for up to 30 minutes. He can’t eat by himself either and has to wear diapers. In a recent interview with Pear Video, Chu Xiaoping said that her greatest wish was for Wang to call her mother just once, but she knows that will never happen.